Most startups and small businesses don’t bother creating a budget, or forecasting their financial results for the upcoming year, but I think there are a number of reasons why you should spend some time at the beginning of the year and create some forecasts for the year ahead. These are all questions that you as an entrepreneur should be able to answer (if they apply to your situation). If you can’t answer these questions, then it is time to spend some time using ProjectionHub or another budgeting tool to create at least 3 financial projection scenarios for the 12 months ahead. The easiest thing to do is to start with what you did last year. Last year is probably the best predictor of the next 12 months. Or if you grew 5% per month last year, you may just assume that same growth rate continues for the next 12 months. Another great way to project the future is signed contracts for the upcoming year. If you already have contracts signed with customers for the next 12 months, use that as your most likely scenario. If you are brand new startup, then you are simply going to have to make a bunch of assumptions about your sales and expenses. Do your best to use industry data from a source like BizStats to get an idea of what others in your industry are doing. Next, you should dream big and come up with a best case scenario. This should show you your sales projections if everything goes your way over the next 12 months. If you are able to retain current clients, and you are able to secure that new large client, or strike that business development deal. This scenario should still be based on data, and should still be realistic. A good example is if you are a SaaS company and you are currently experiencing a 90% retention rate each month, the best case scenario could assume that you bump that up to 95%. Another example could be, your website currently converts 25% of visitors to sign up for an account, but you are planning on making some changes to the landing page which you hope will improve that conversion rate to 35%. Finally, it is important to plan for the worst case scenario. This is similar to stress testing at banks. Banks conduct stress tests to determine what would happen if a certain % of their portfolio defaulted. Could they still survive if 10% of loans went bad? 20%? 30%? By conducting these tests you will be able to better mitigate these risks and avoid the worst case scenario. 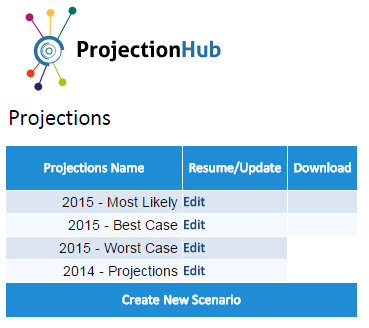 So if you haven’t completed financial projections for 2015 yet, spend some time with ProjectionHub now and get this important planning process off your list in the new year.